Gardens and window boxes have the potential to surrender to winter gloom in January. A little imagination though can give your garden a much-needed winter boost in the bleak midwinter. Much known for its medicinal qualities, one such plant is witch hazel (Hamamelis Mollis) which provides a pop of yellow, orange or red winter flowers depending on the variety. It’s paper streamer flowers are unmissable and herald the spring appearing even before the leaves of the witch hazel are fully formed making them a starkly beautiful addition to any garden. It’s got an added bonus of providing a spicy winter perfume to delight the senses. Chimonanthus praecox or Wintersweet as its name suggests similarly provides a sweet sultry scented delicate yellow flower which sits handsomely amongst its elegant stark silvery stems. An added bonus is the dramatic vase like seedpods which are left once the flowers disappear. A garden with evergreen shrubs is a garden which has structure and colour throughout the seasons and Heavenly bamboo is one such shrub which gives a wonderful firey accent to any garden. Known also as Nandina Domestica it is not a typical bamboo and in its dwarf form it is a perfect shrub where you have limited space to provide a pretty but bijoux fountain of leafy colour in pink, and claret red. Nandina Domestica Firepower provides beautiful autumn winter foliage with longlasting winter berries also. 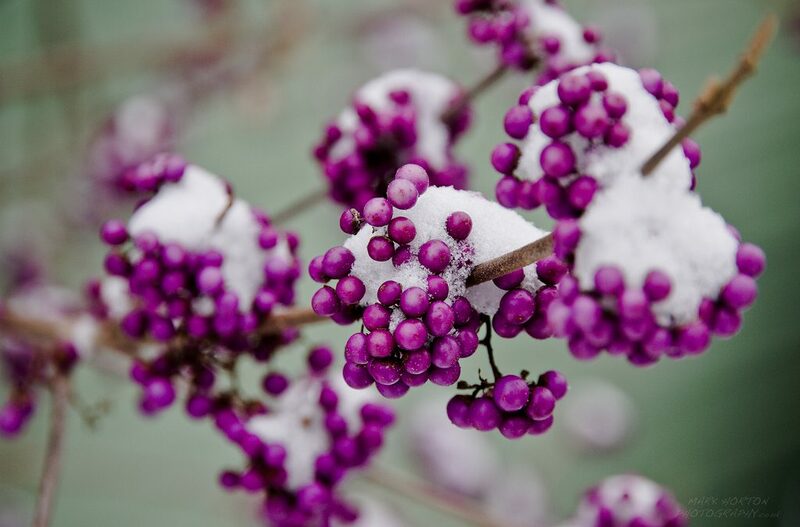 Native to the himalyas, this hardy shrub will prove a worthwhile winter investment. One staple for winter colour every garden should have is Skimmia Japonica. With it’s strong waxy leaves and delicate hail of tiny delicate pink flowers skimmia thrive well in slightly acidic soil. They’re a hardy and reliable genus and provide great value in winter colour with Skimmia Japonica Rubella providing a raft of deep tiny delicate pink flowers and swish of red berries in winter. A great staple also for winter flower arrangements. Callicarpa bodinieri var. giraldii ‘Profusion’ which provides a profusion of deep purple berries set against deep green foliage in late autumn winter season. A profusion of delicate purple flowers in early spring gives way to bronzed foliage which will once again add early colour. Cotoneasters are a great go to plant for colour foliage flowers and berries. Cotoneasters are a great go to plant for colour foliage flowers and berries. Cotoneaster Cornubia is a particularly hardy and reliable variety which gives an abundant crop of red berries which will weigh down the branches. As a partially evergreen shrub, the leaves will provide excellent winter colour and a great foil to show off the magnificent crop of fruit. This shrub is no shrinking violet so give it pride of place and plant to allow for 3 metre potential growth and spread.